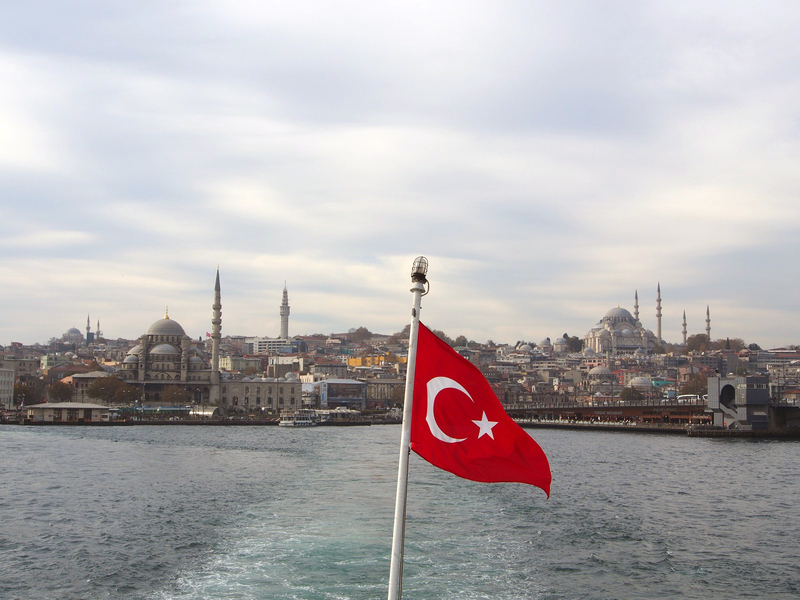 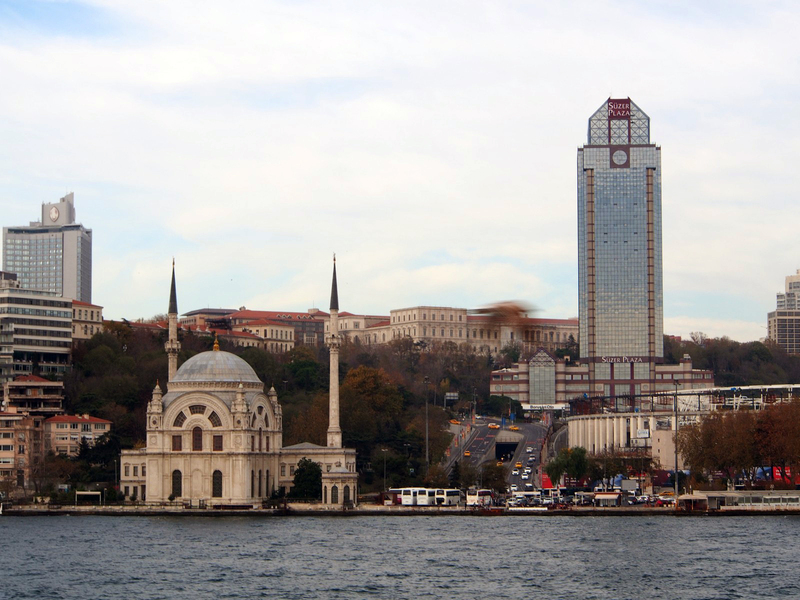 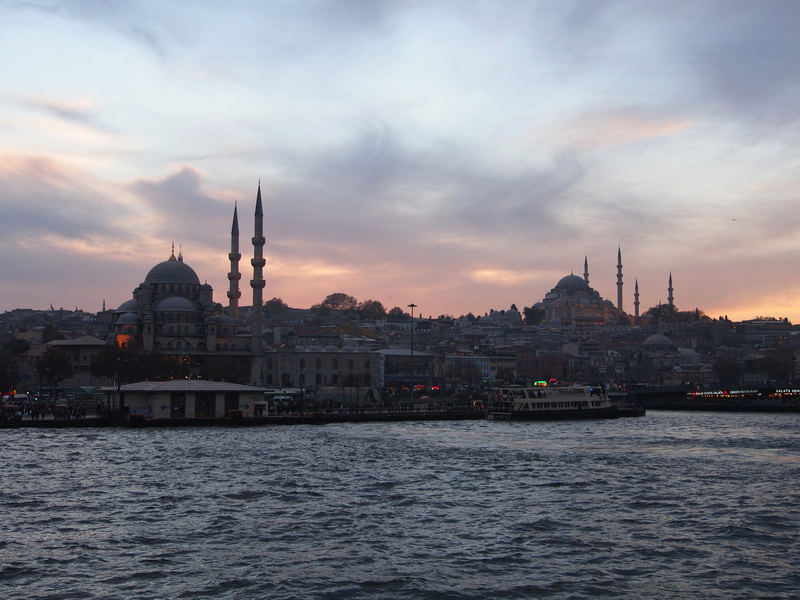 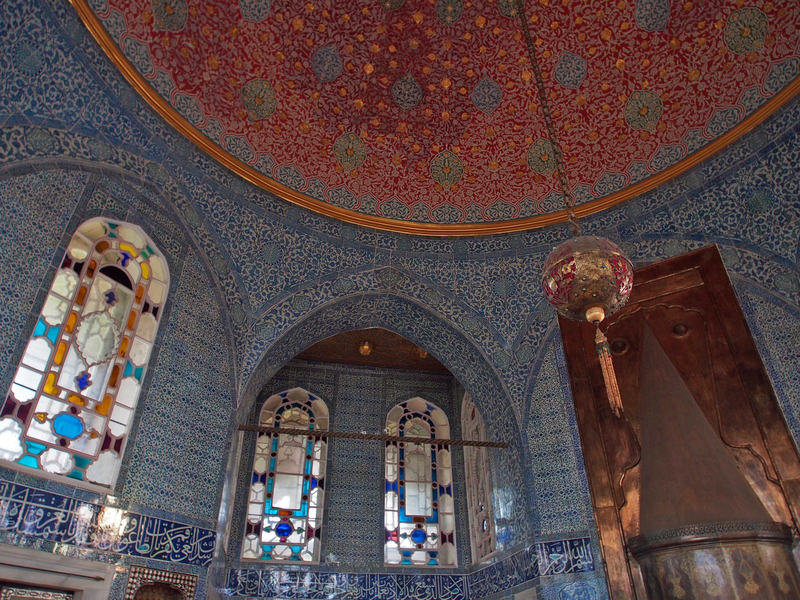 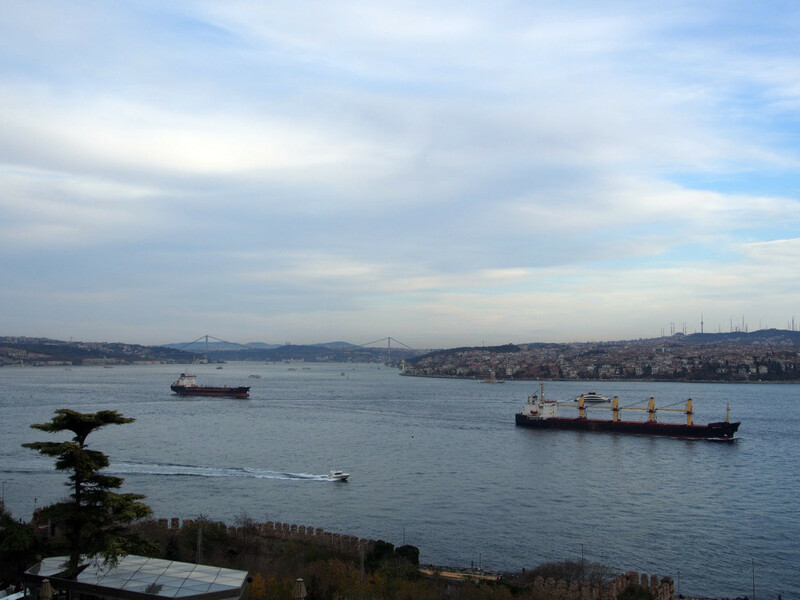 Since I spent a week kicking around Istanbul, there’s plenty more to see and do. 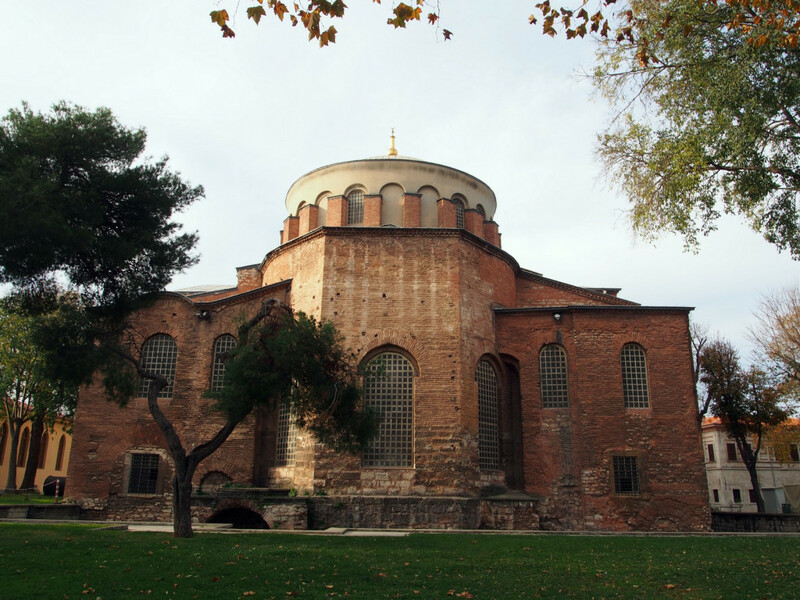 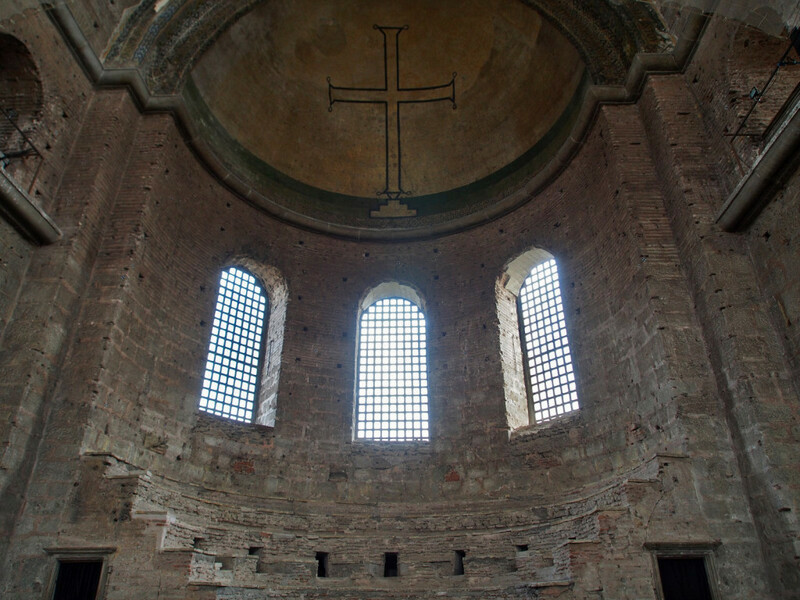 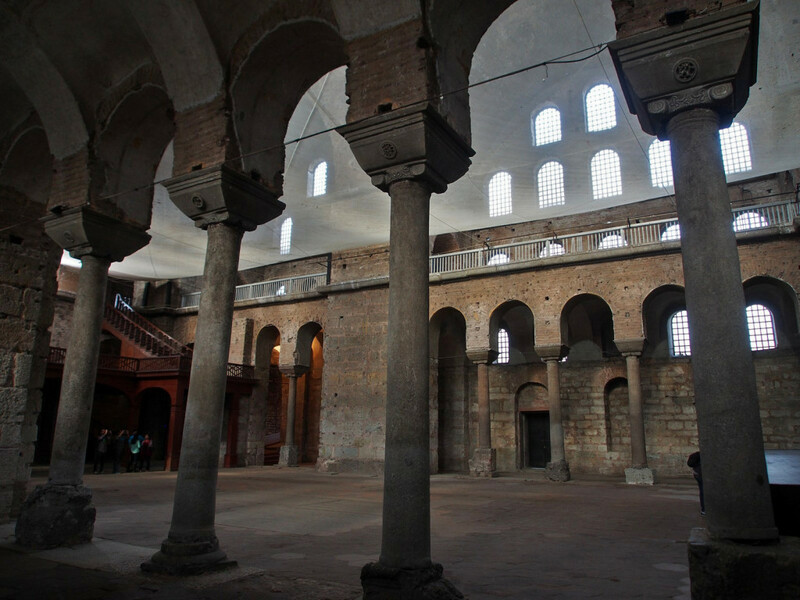 The Hagia Irene is actually older than its better known sister, the Hagia Sofia, but is in original condition. 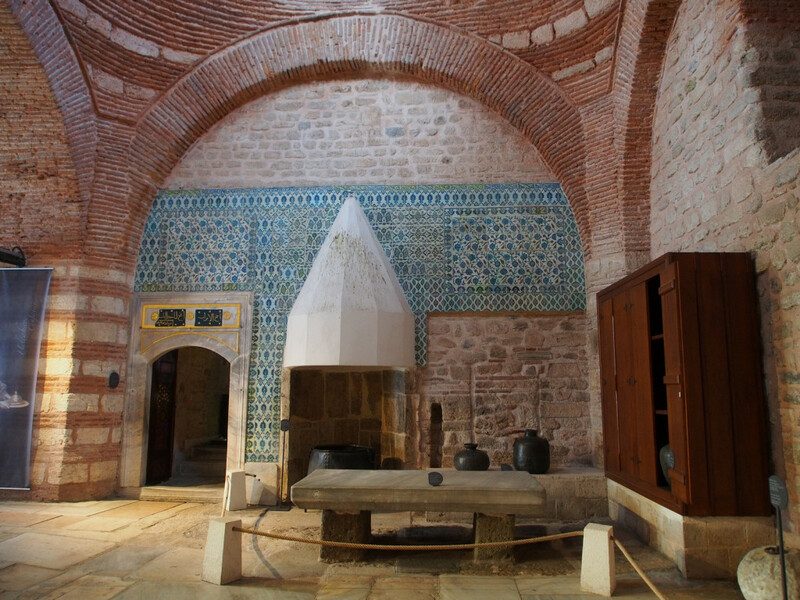 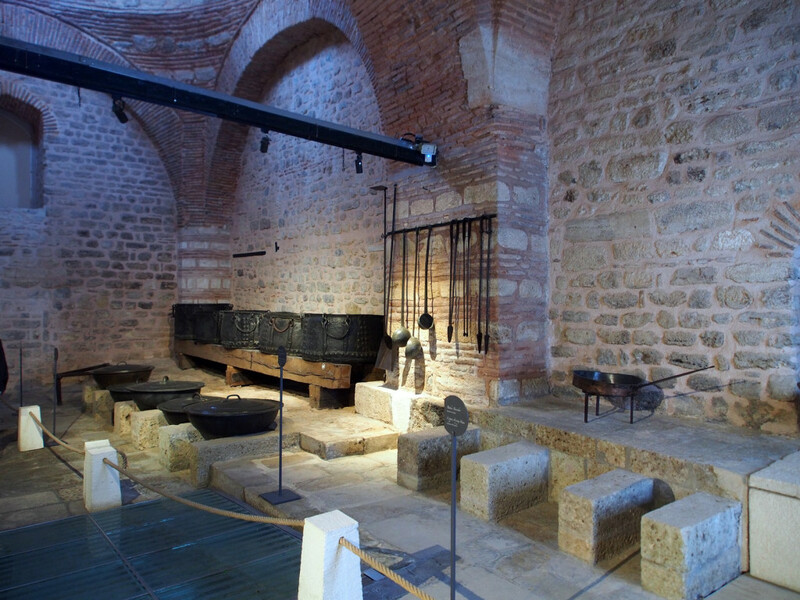 The Ottomans used it as an armoury and warehouse, and it is mostly unrestored. 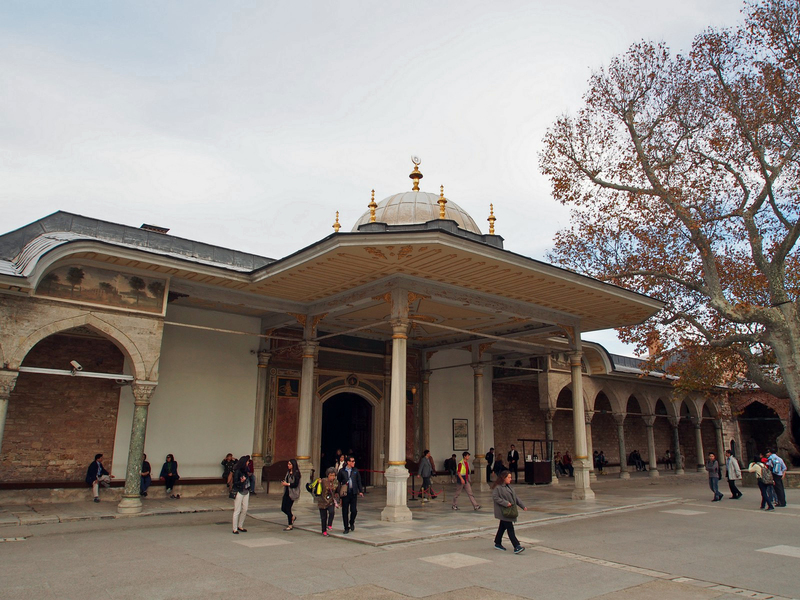 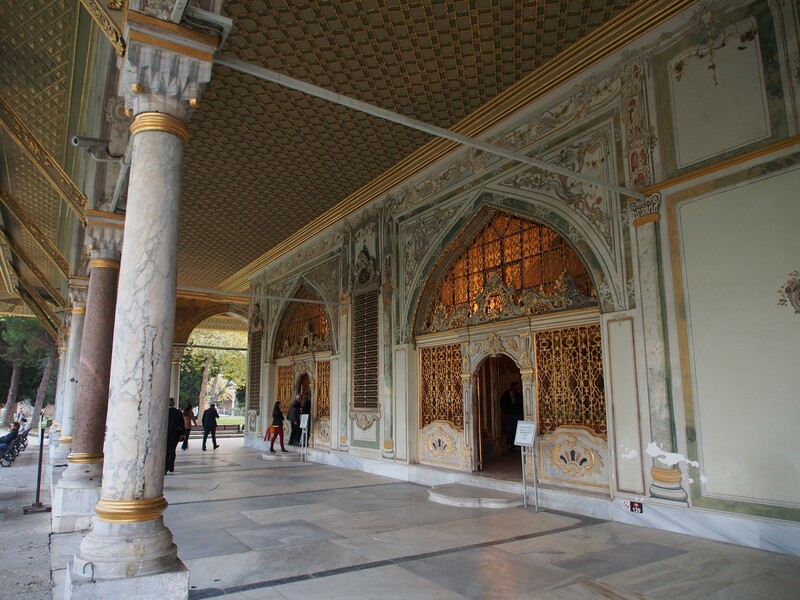 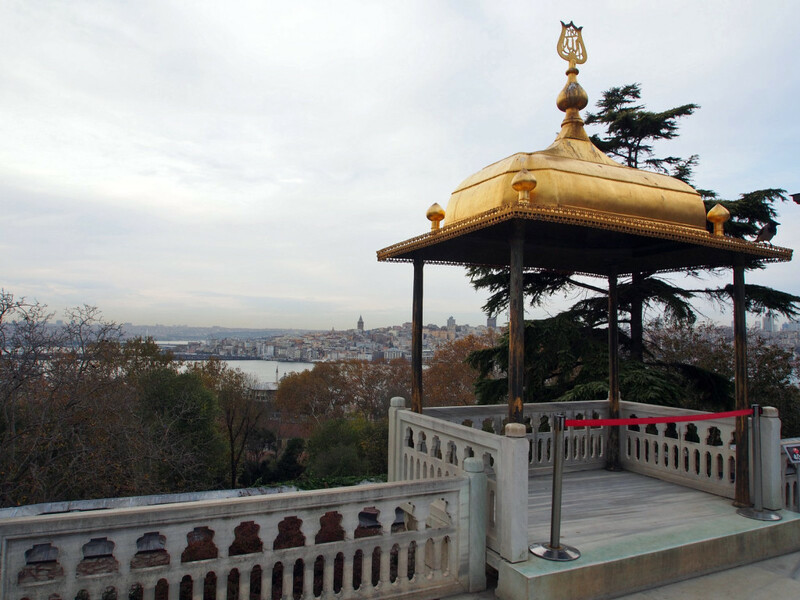 The last ‘big’ sight in Istanbul is the Topkapi Palace, the epicentre of the Ottoman Empire and private residence of the Sultans and their retinues. 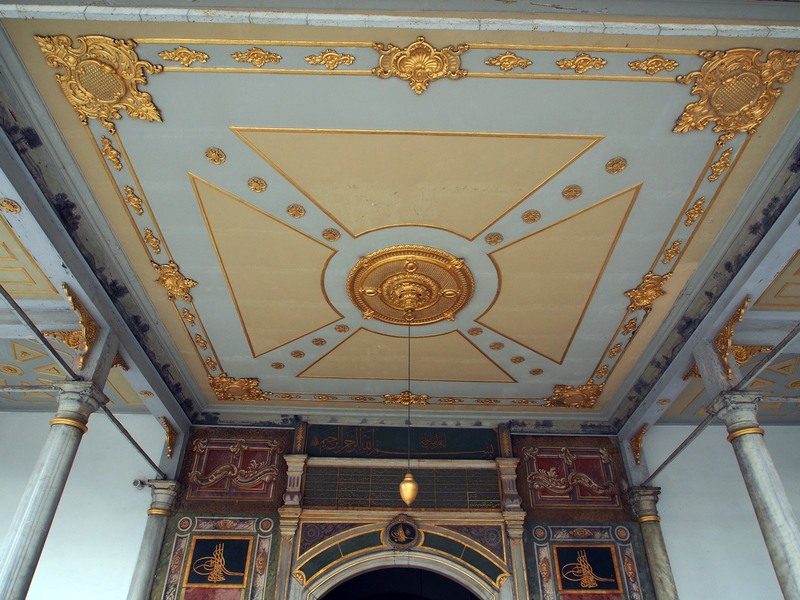 Its plan follows a layered series of four courtyards, with the exclusivity and privacy increasing as you go further in. 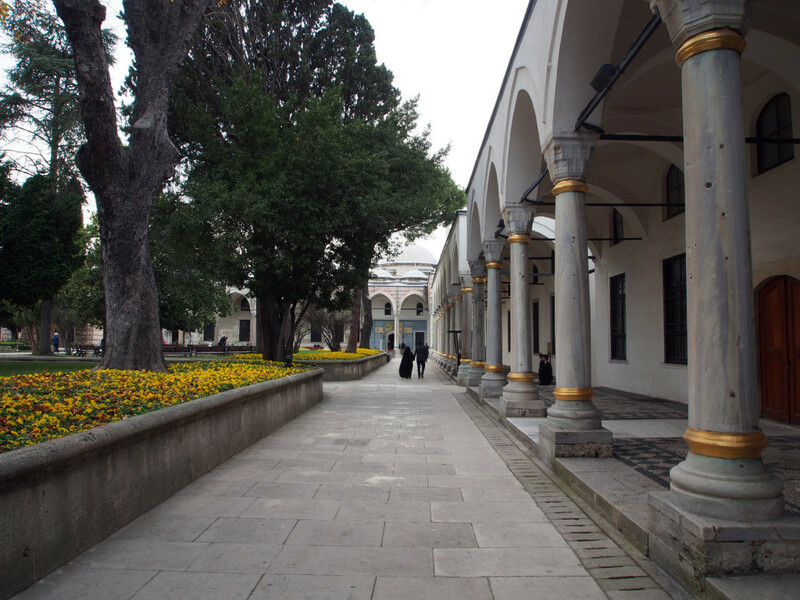 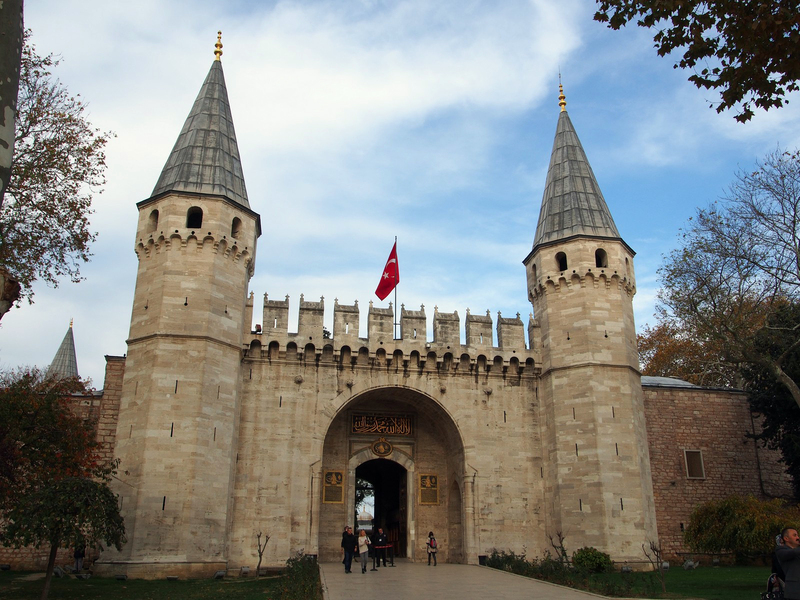 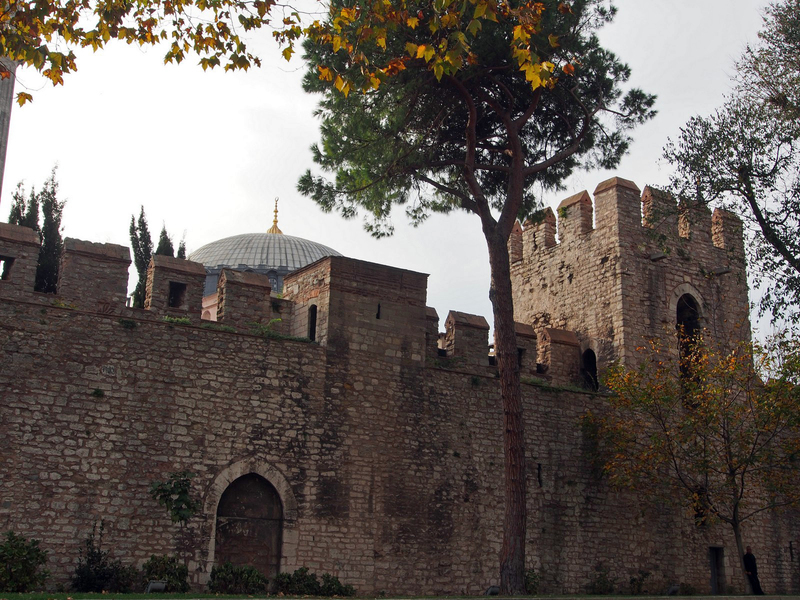 The outer walls run across much of the old town, enclosing the first courtyard (including the Hagia Irene and parkland), then leading to the Gate of Salutation – the main entrance to the palace complex proper. 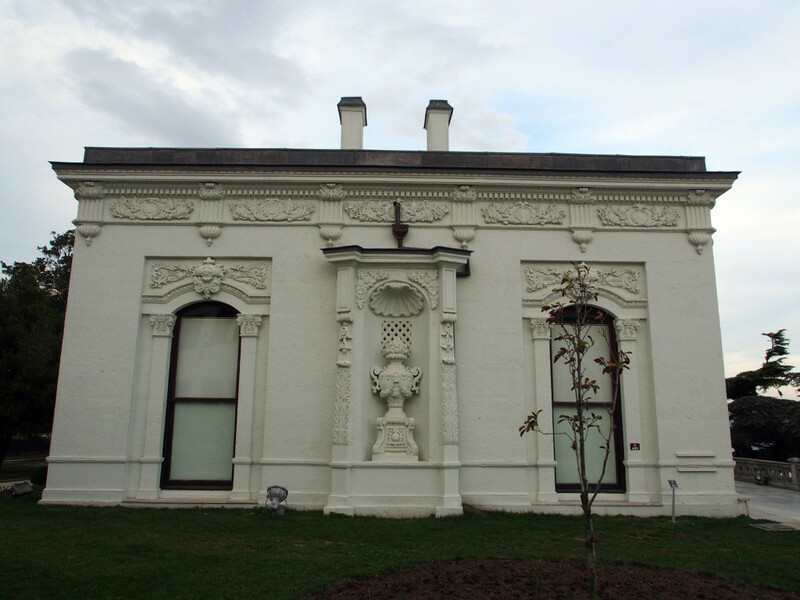 The palace kitchens are off to one side, and once employed up to 1000 people. 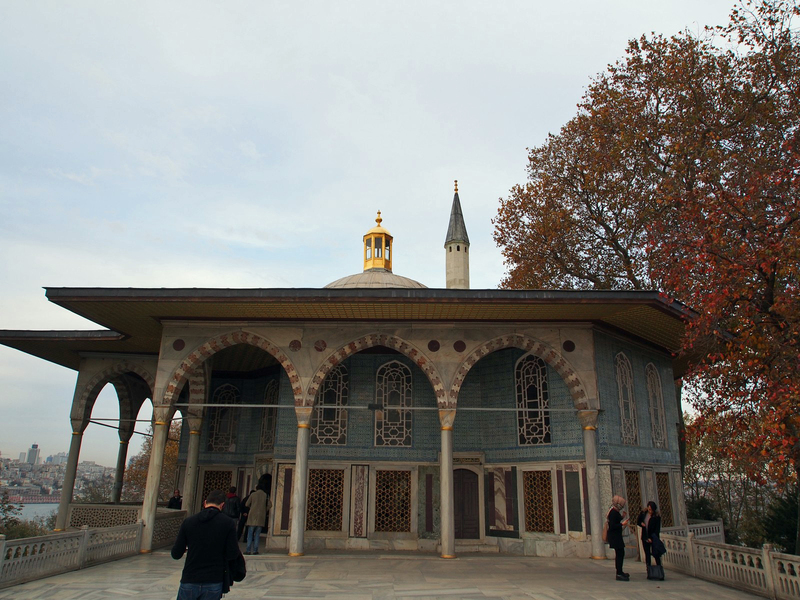 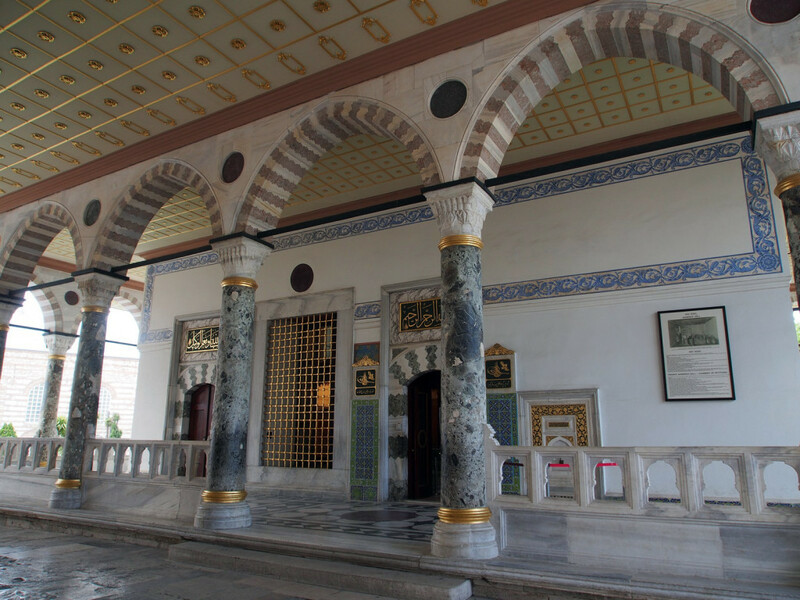 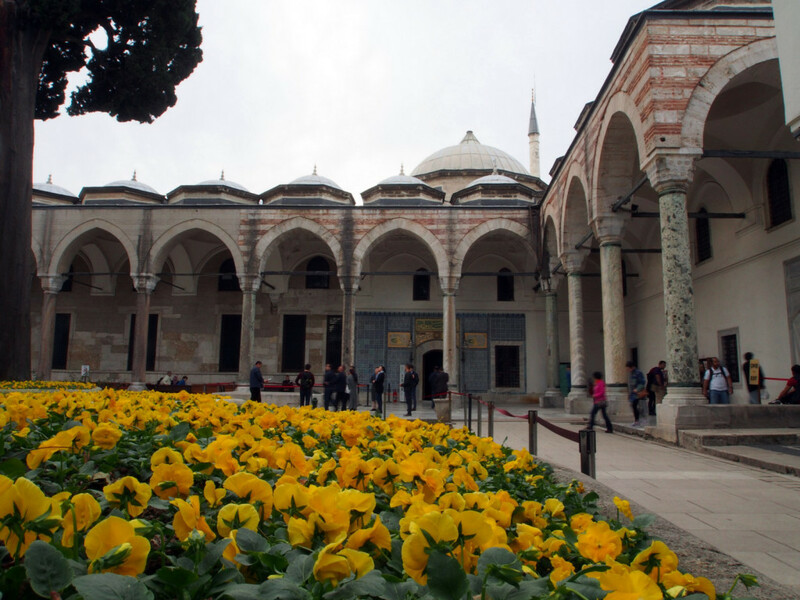 In the second courtyard, the Sultan issued decrees, administered justice, and held his Council meetings. 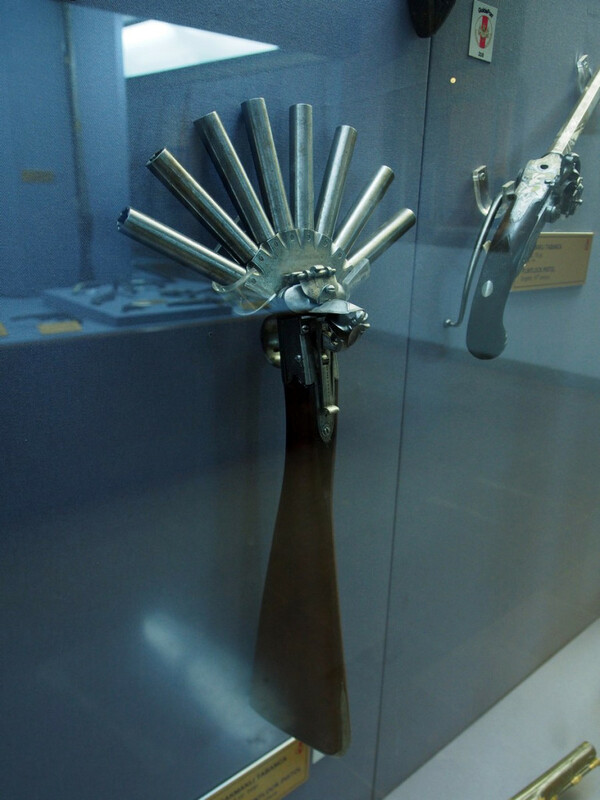 There’s also an armoury with a collection of antique weapons. 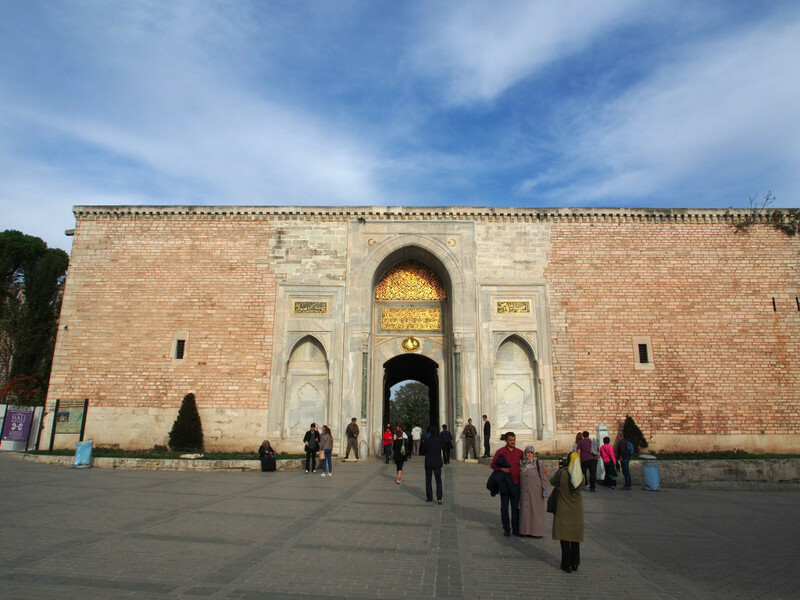 The Gate of Felicity leads to the third courtyard and the private parts of the palace. 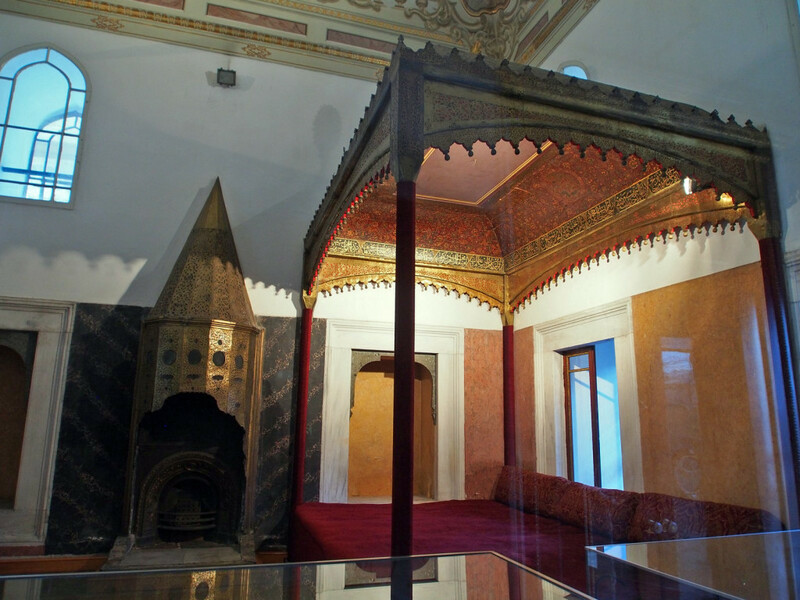 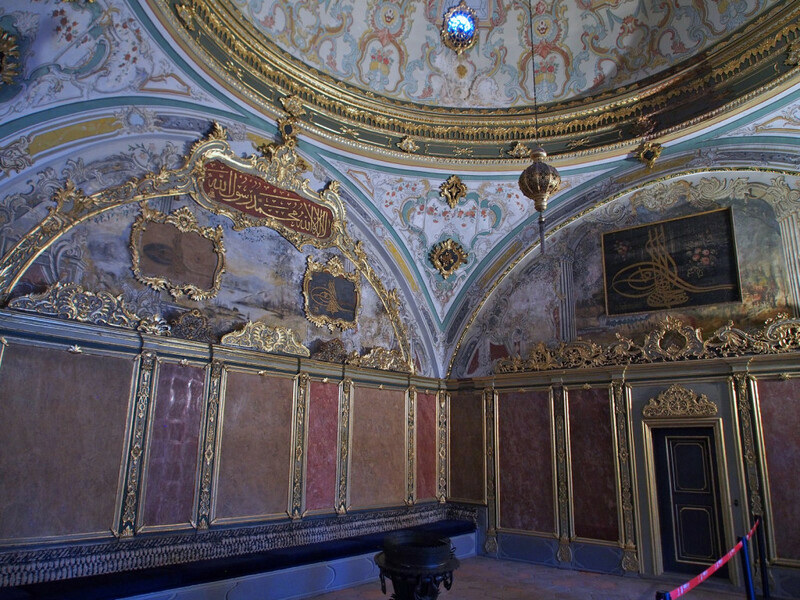 Immediately inside is the Audience Chamber, where the Sultan’s throne sat for important individual political and diplomatic meetings. 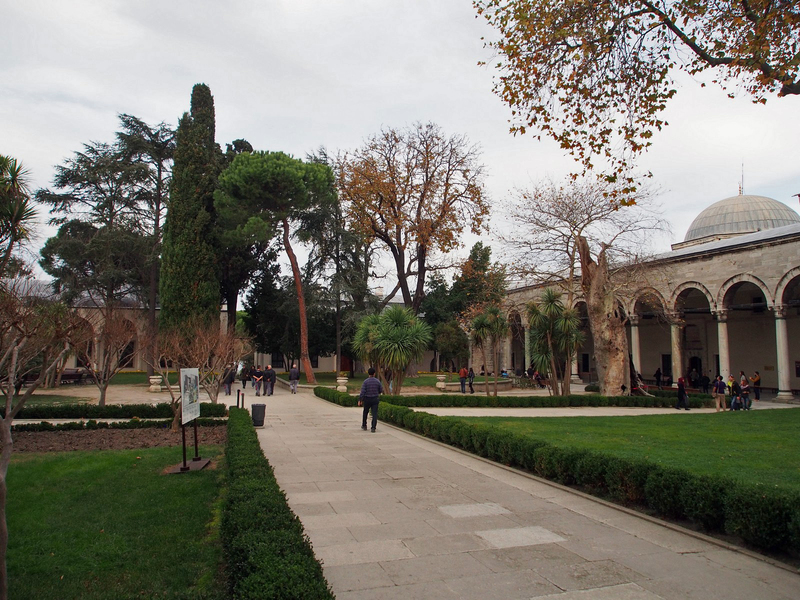 The third courtyard contains a number of key buildings: the Palace Treasury, now a museum of some of the historic riches and objets d’art; and the Privy Chamber which now houses a number of sacred relics, including possessions of the Prophet Mohammed, the swords of the first four Caliphs, the Staff of Moses. 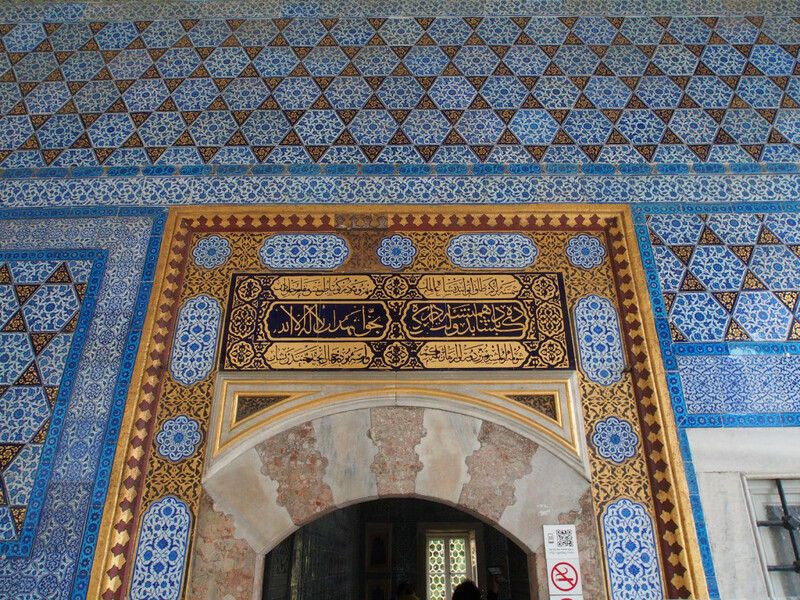 No photos allowed inside any of the collections, and probably just as well considering the crowds. 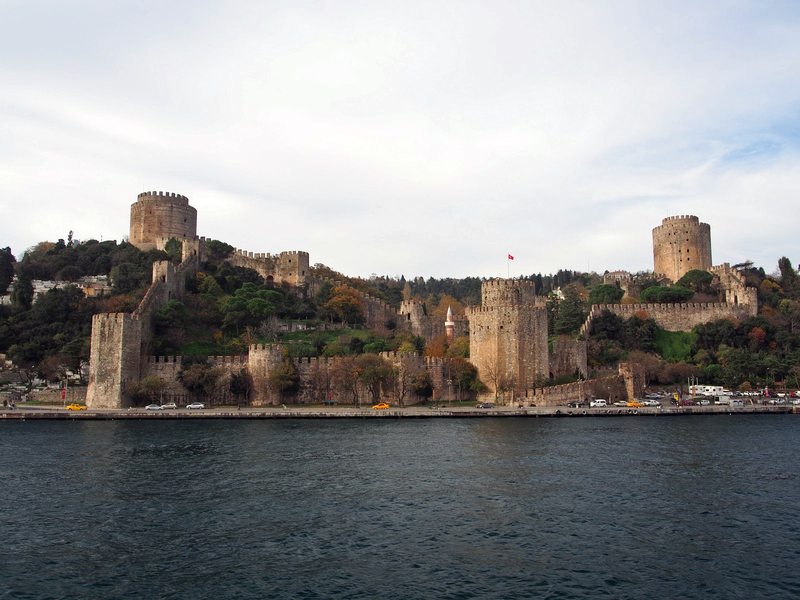 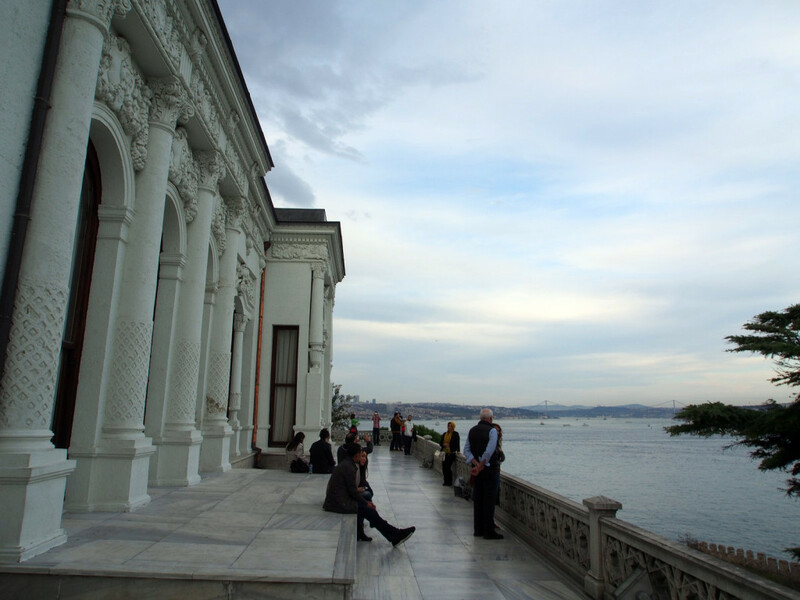 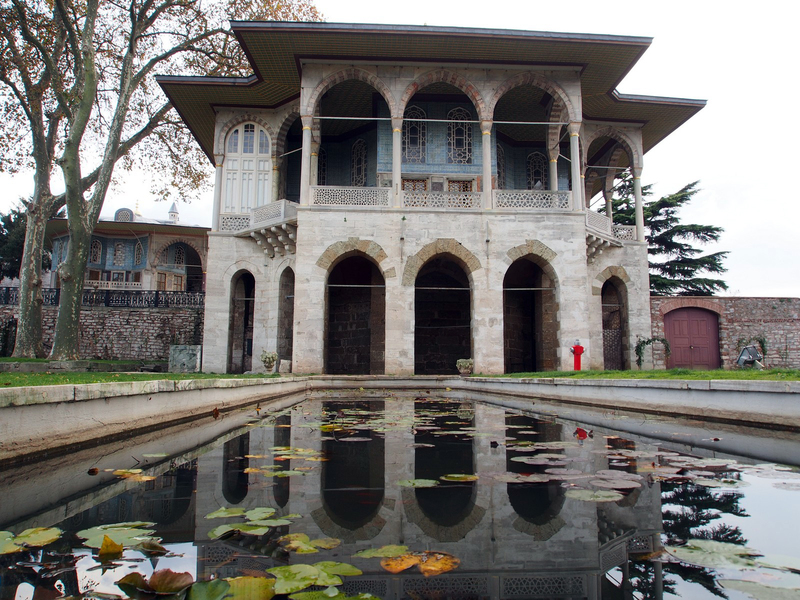 This part of the palace also has sweeping views over the Bosphorus. 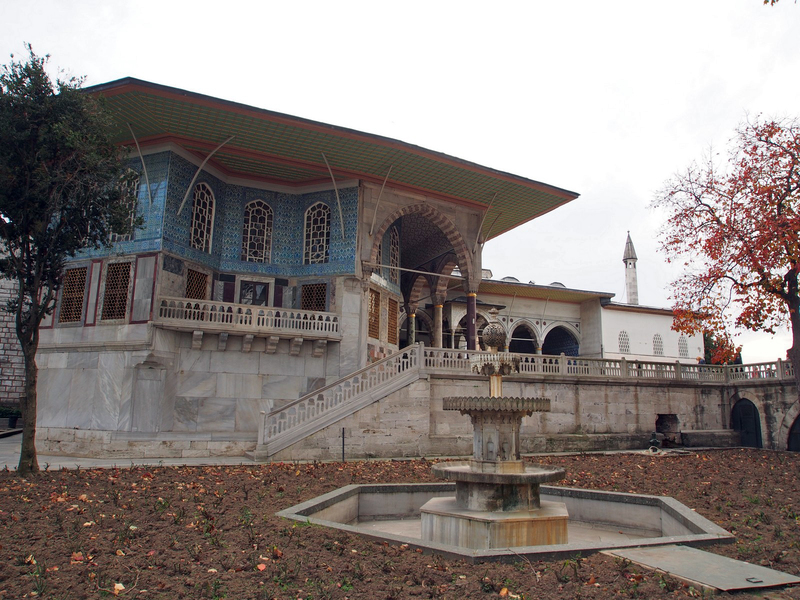 The fourth and final courtyard houses the private quarters of the Sultan himself, and was off-limits to all others (except of course the omnipresent servants and guards). 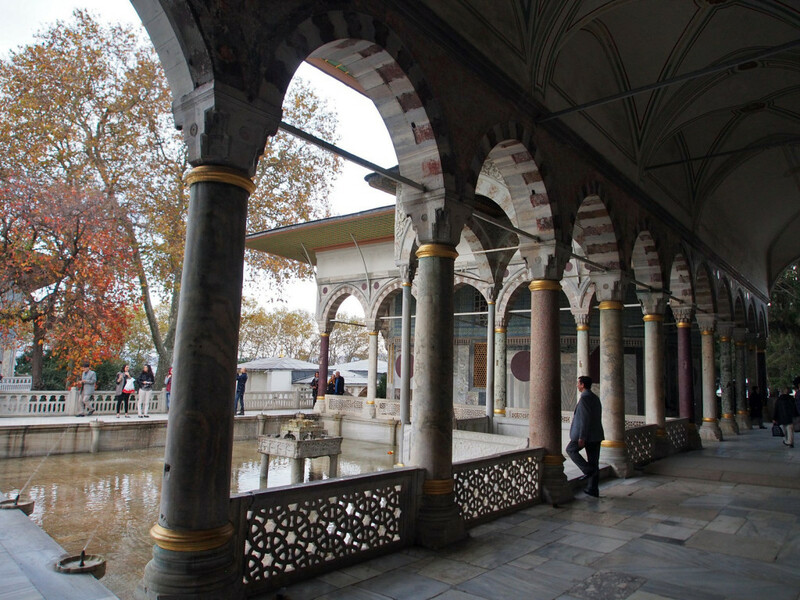 There are a number of pavilions and small buildings. 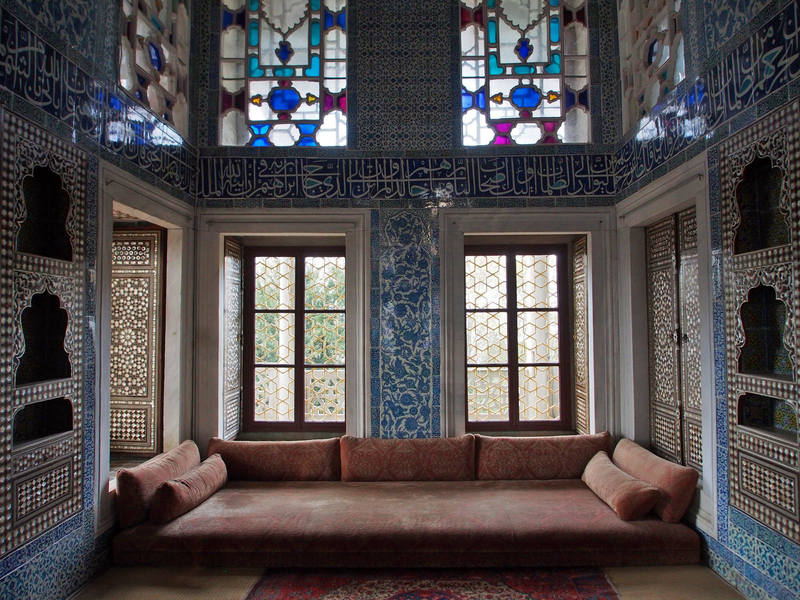 The interiors here are, to coin a phrase, fit for a king. 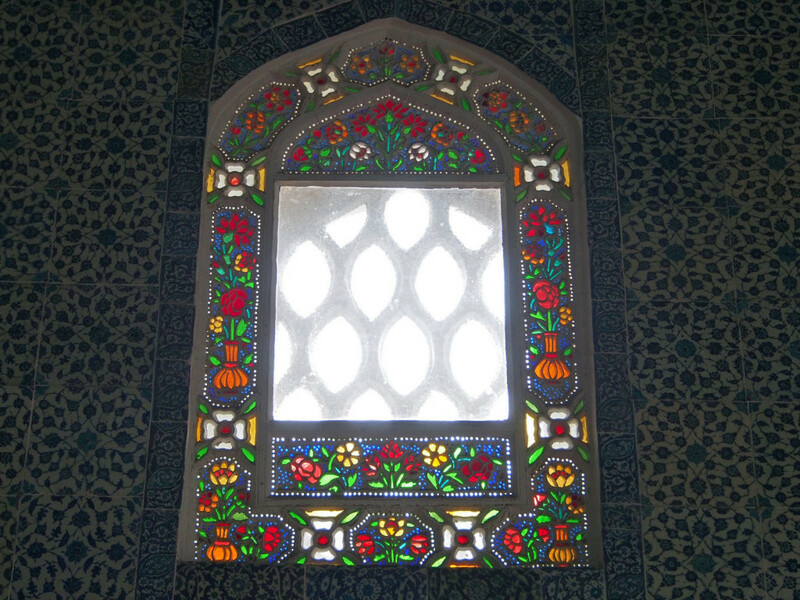 The glazed mosaic tiles seen throughout the Islamic world play a strong part, as do mother-of-pearl inlays and stained glass windows. 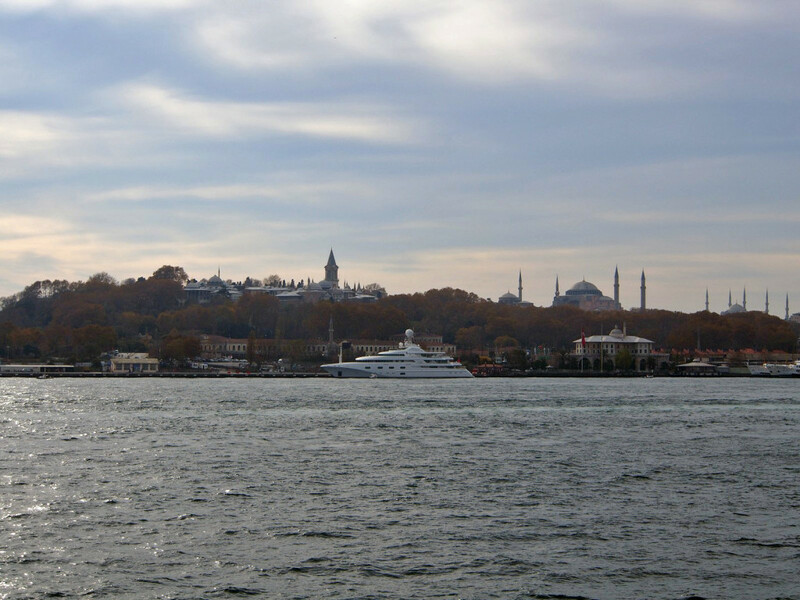 One of the best ways to spend a day in Istanbul is to take a cruise on the Bosphorus, and see the city from a different perspective. 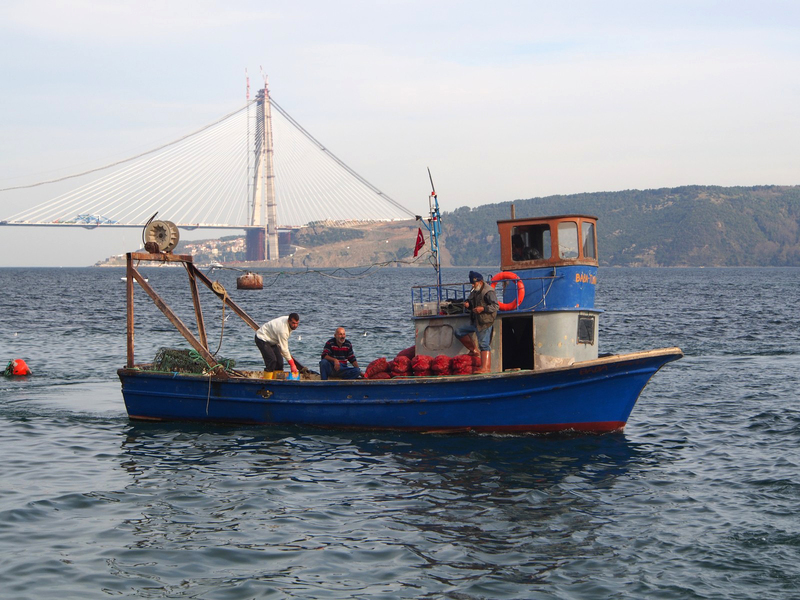 The ferry takes you to a tiny town near the mouth of the Black Sea, where you can have a relaxed seafood lunch and watch the passing fishing and cargo ships. The boat gets back just in time for sunset, too. 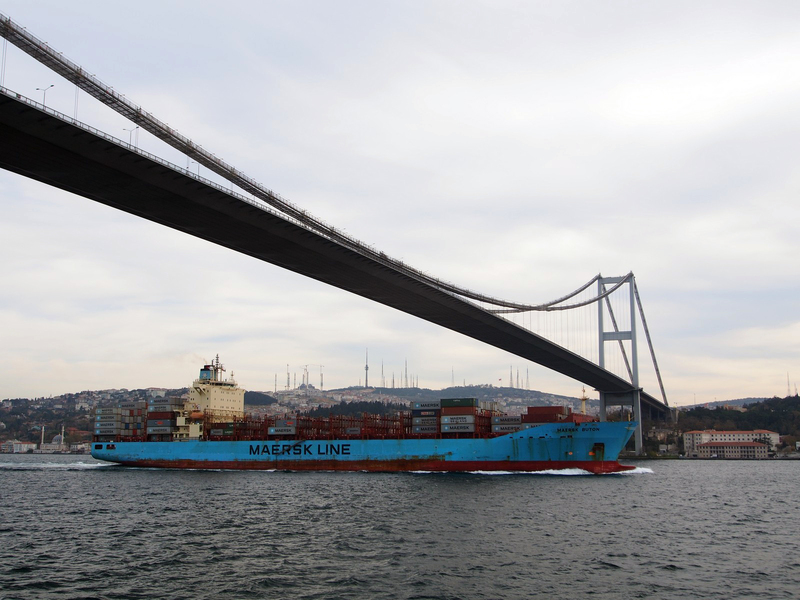 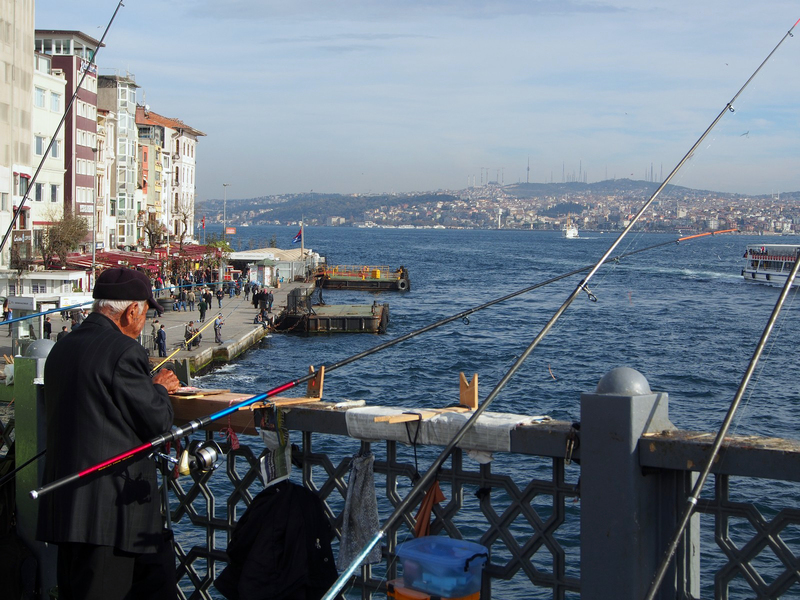 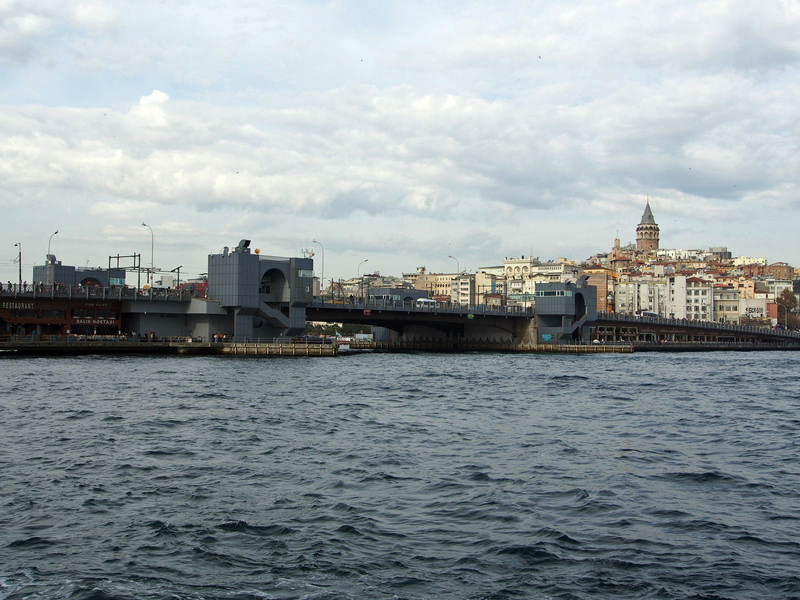 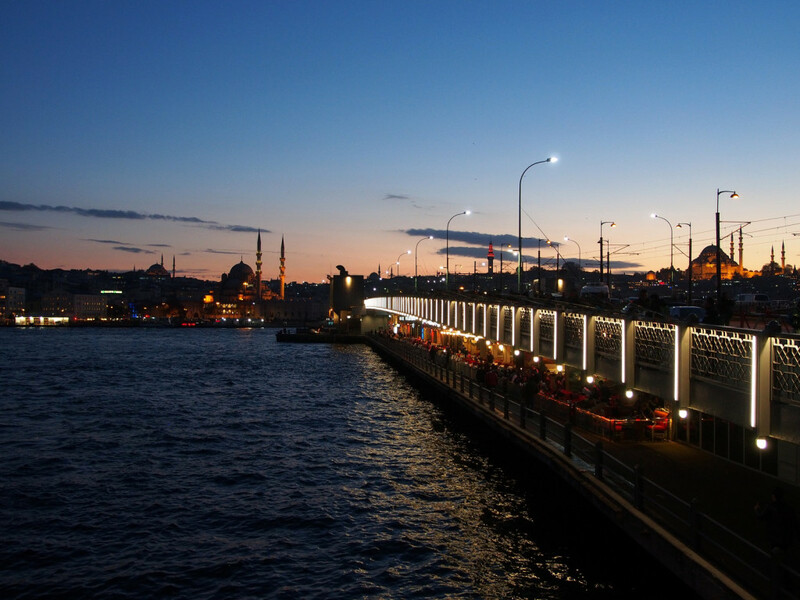 The Galata Bridge joins the palace quarter with the rest of the European side of the city across the Golden Horn. It has been replaced four times over the centuries, and is a touchstone of Turkish culture. 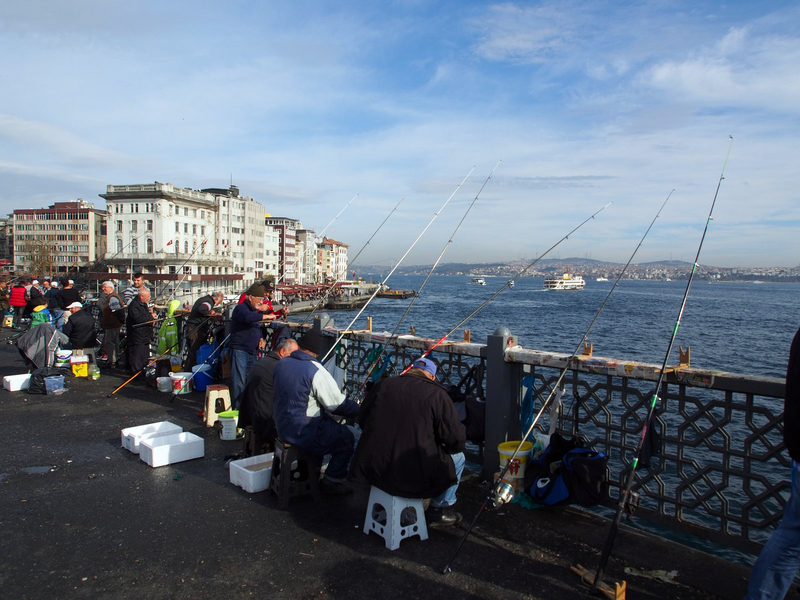 At any time of day it’s covered with local fishermen. 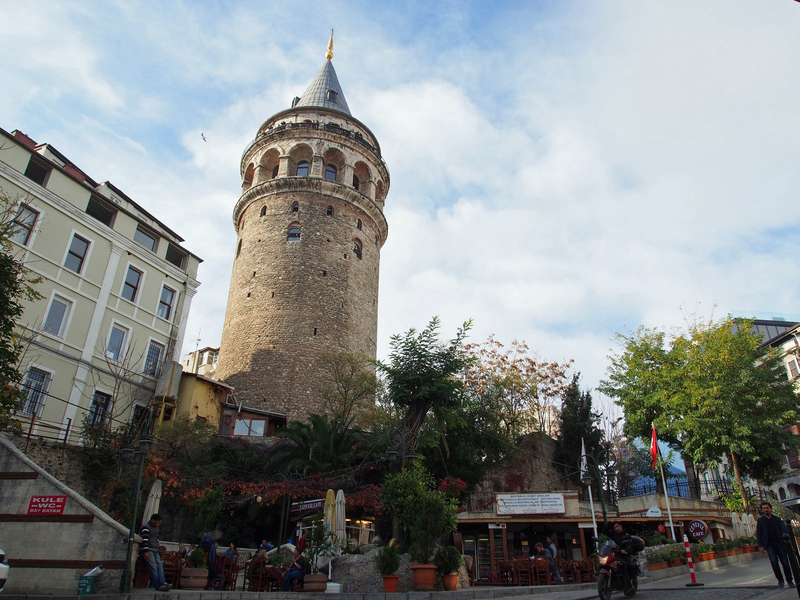 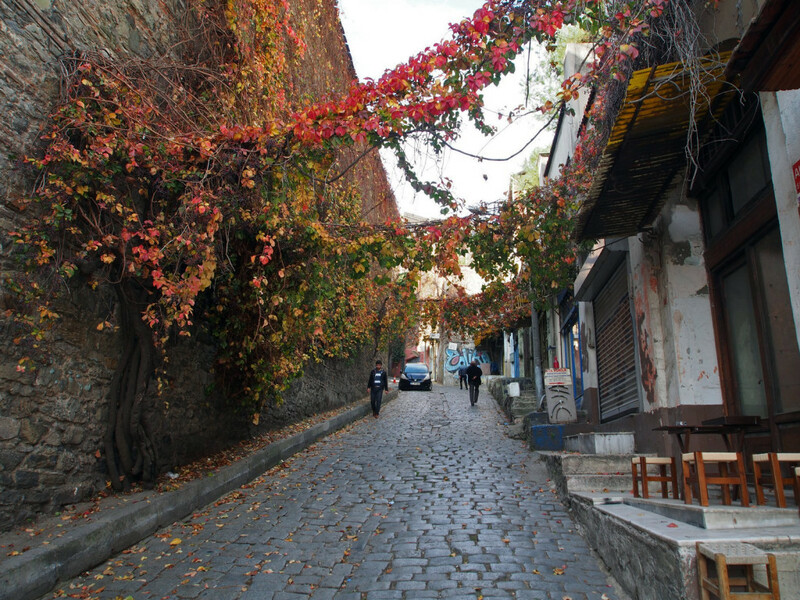 The suburb of Galata on the far side was originally the Genoese merchants’ quarter, and still features tight twisting alleyways, climbing the hill to the 14th Century Galata Tower. 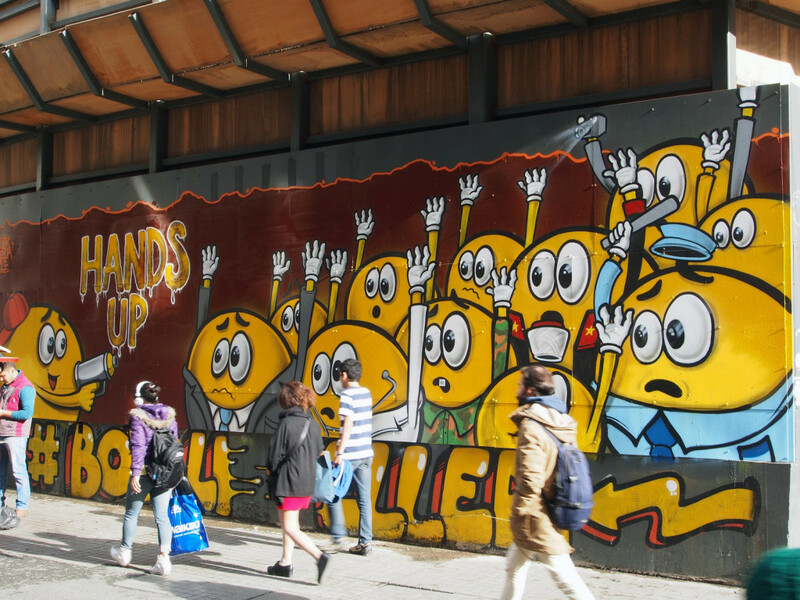 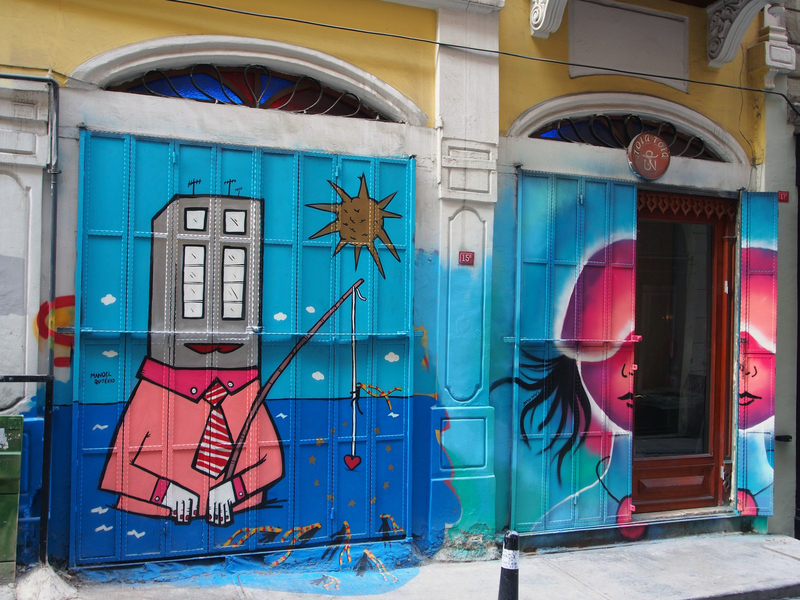 Since this area is now the centre of the local artist and bohemian scene, the walls abound with street art. 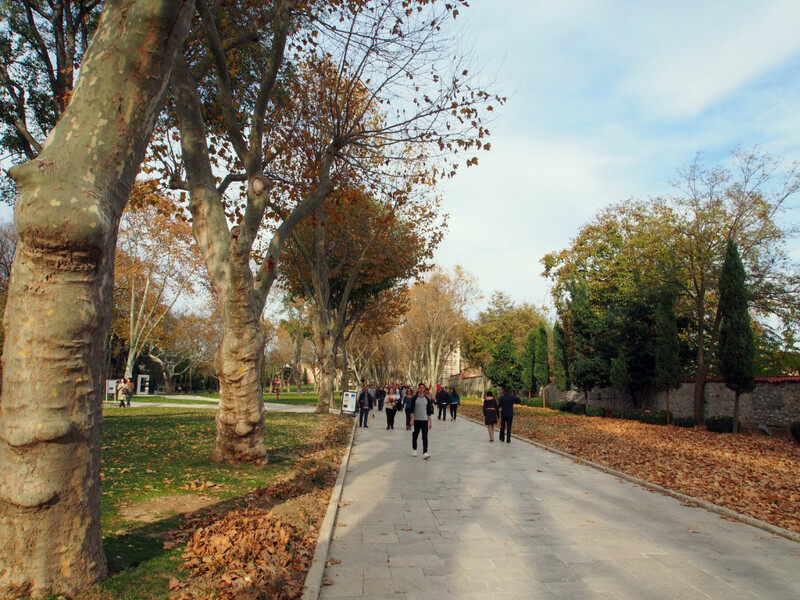 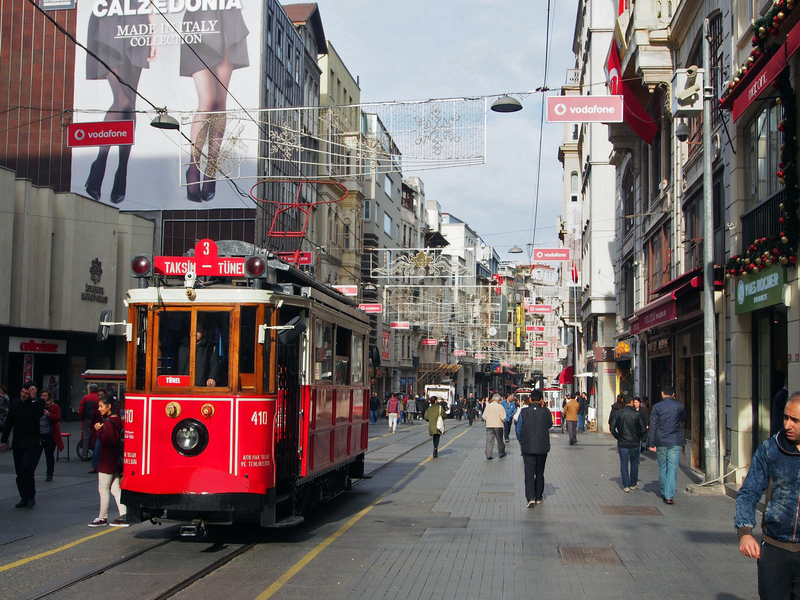 At the top of the hill, a wide pedestrian avenue connects this area to Taksim Square, one of the most important open spaces in the city and the heart of modern Istanbul. 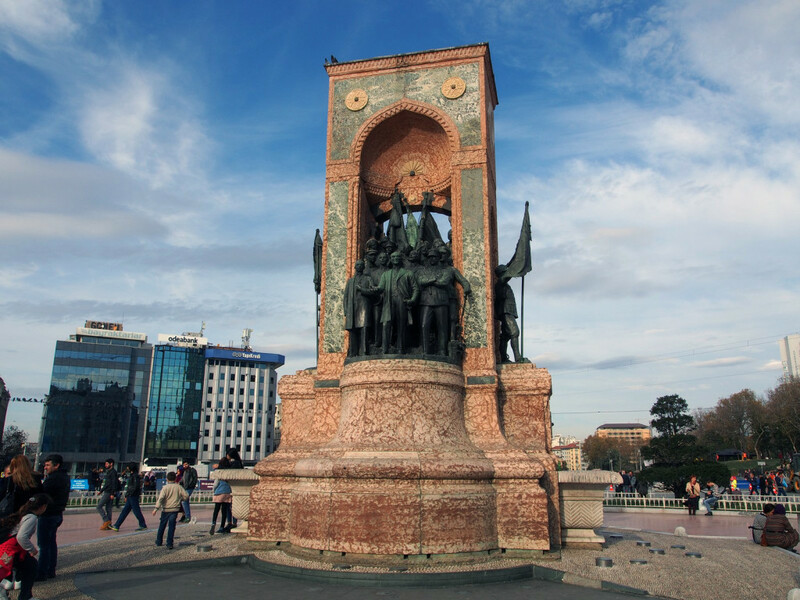 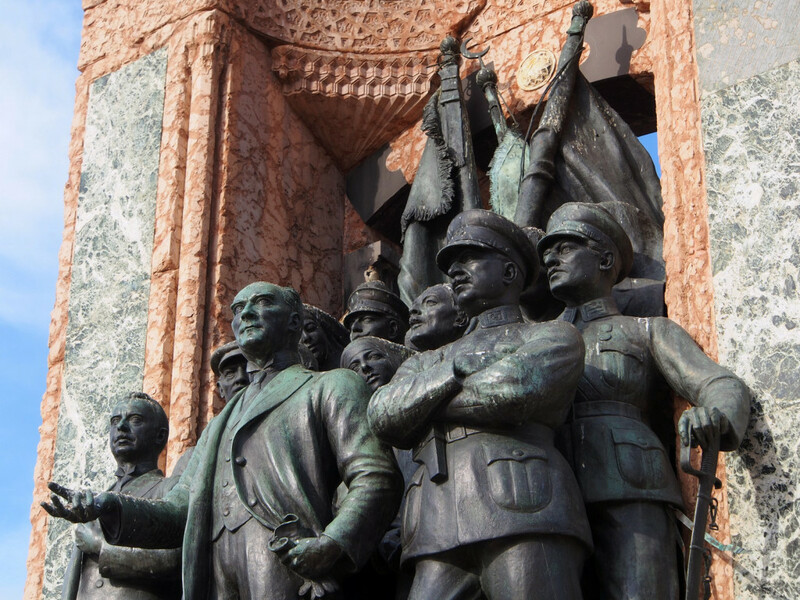 At Taksim Square, there’s a large statue dedicated to the founding of the modern Republic. 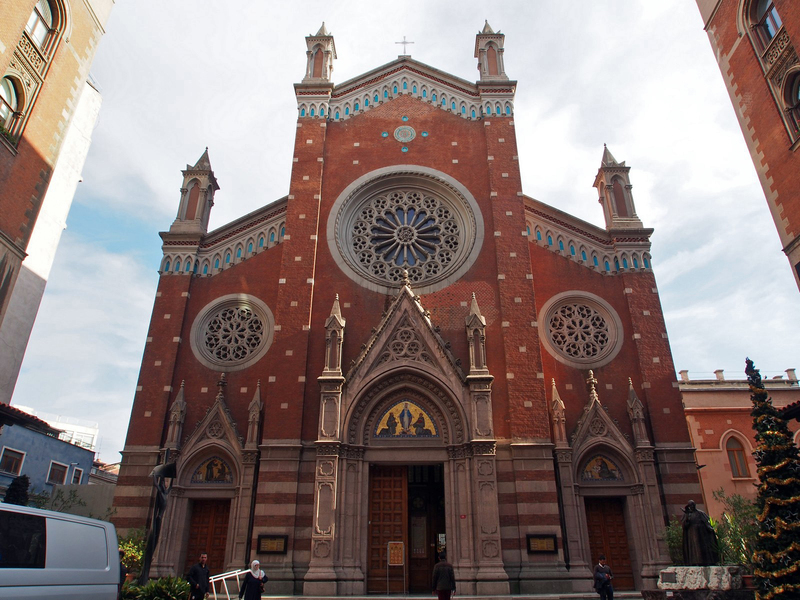 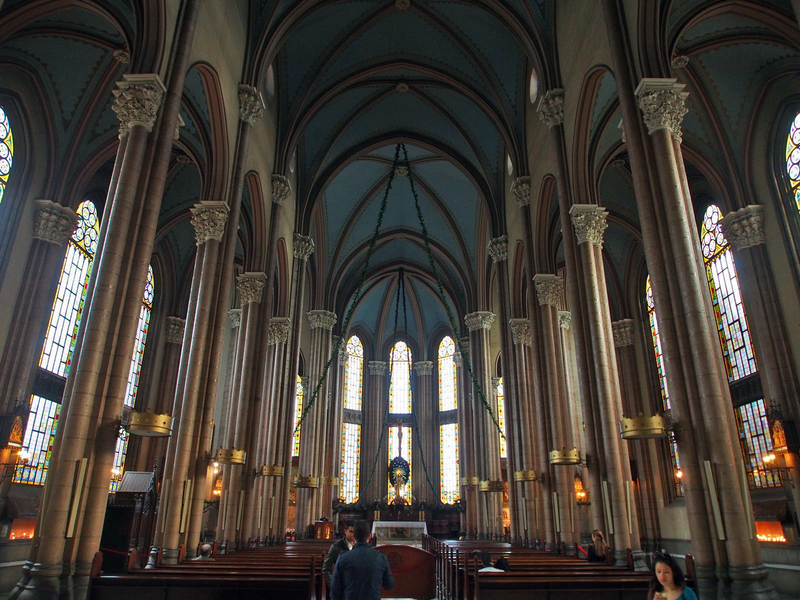 Along the way is the largest Roman Catholic church in the city, St Anthony of Padua. 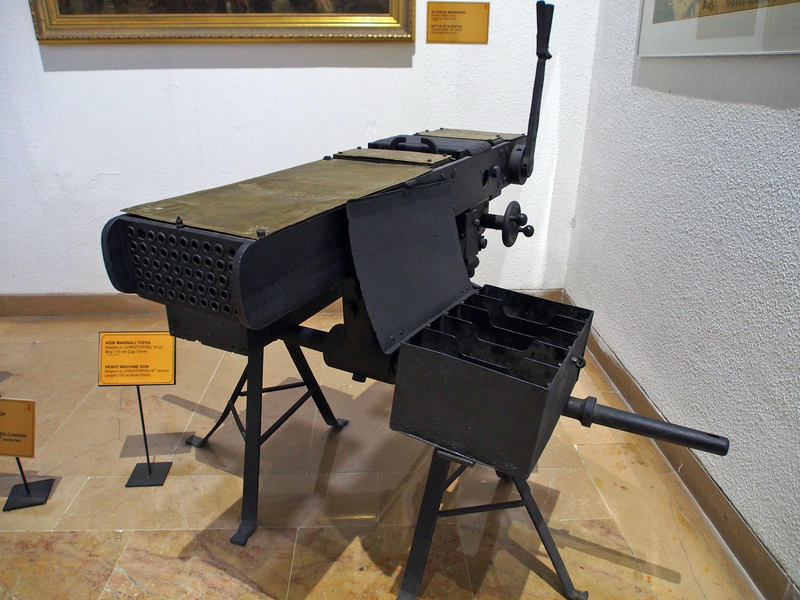 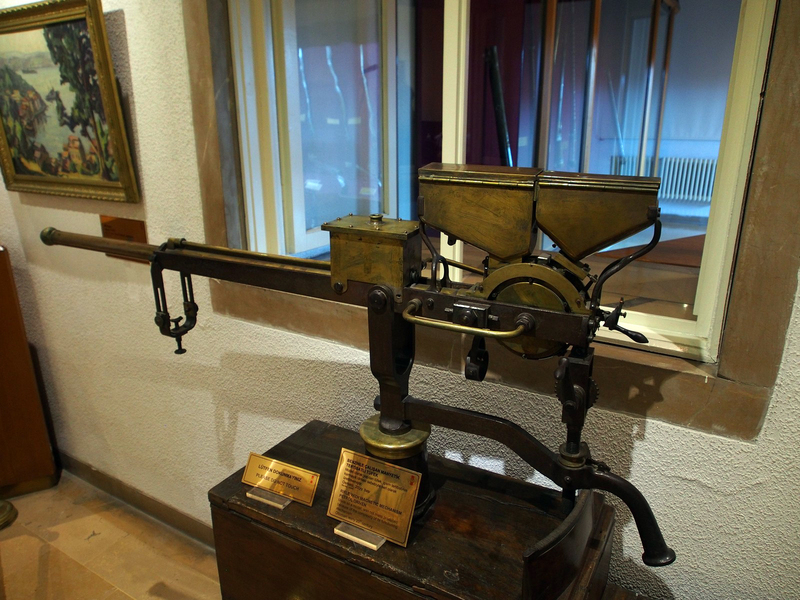 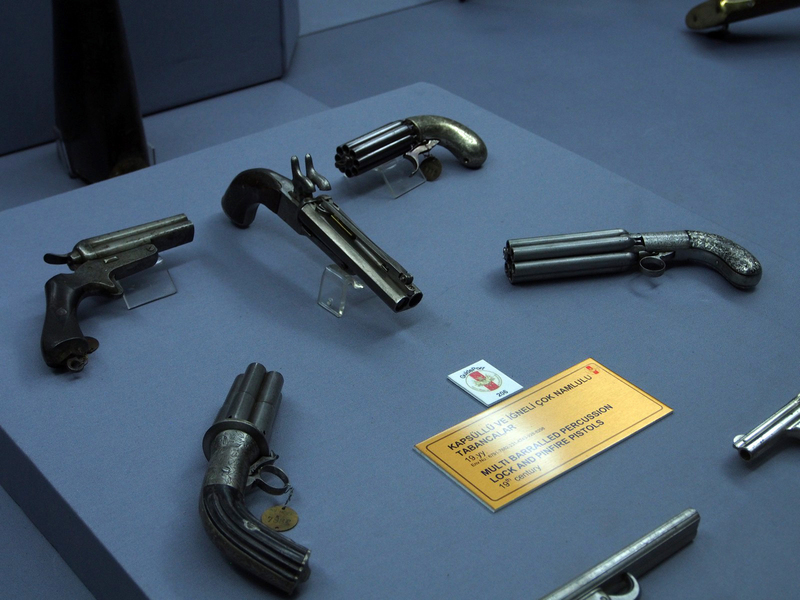 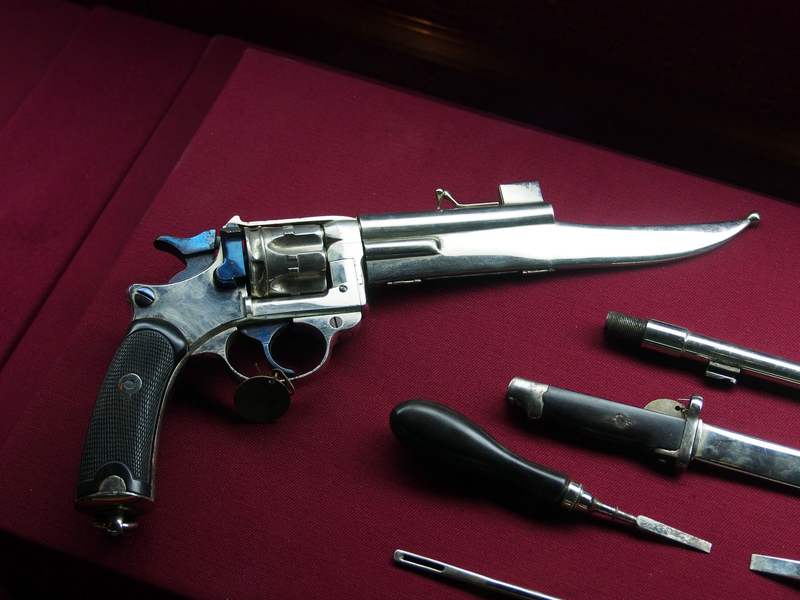 My final visit in the city was to the Military Museum, which for a military history buff like myself has an amazing collection – some of the crazier weapons in particular – pistols with eight barrels or bayonet barrels, machine-guns with fifty barrels or a petrol-driven motor and magnetic actuation. 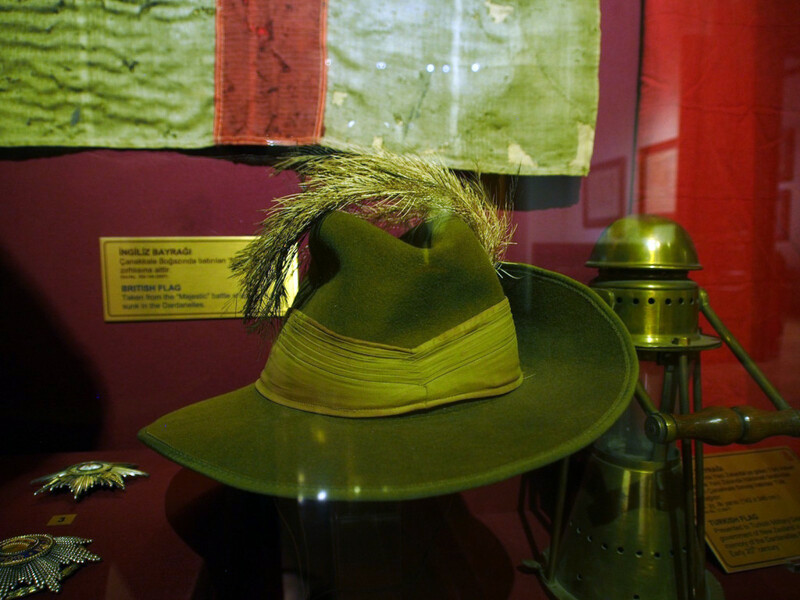 There’s also a section on the Dardanelles campaign, including a familiar piece of headdress (to Aussies). 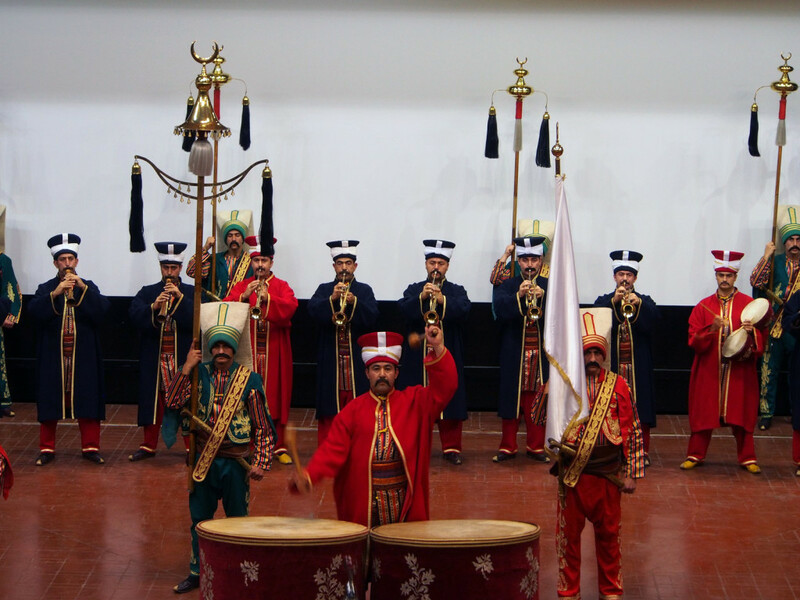 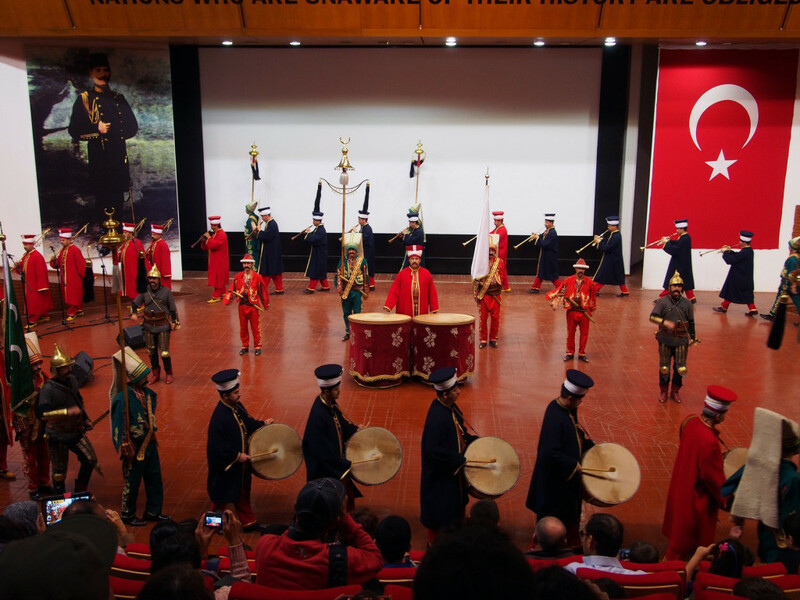 The undoubted highlight here though is the Mehter Band – a recreation of the Ottoman Army’s notorious marching band. They play a concert every afternoon, in full reproduction uniforms and all. 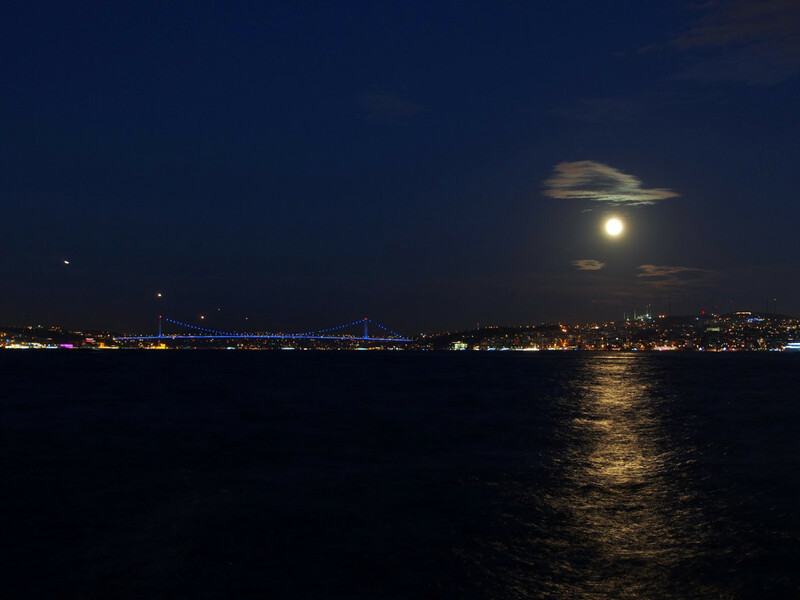 It was just about time to leave Turkey, after almost a month. 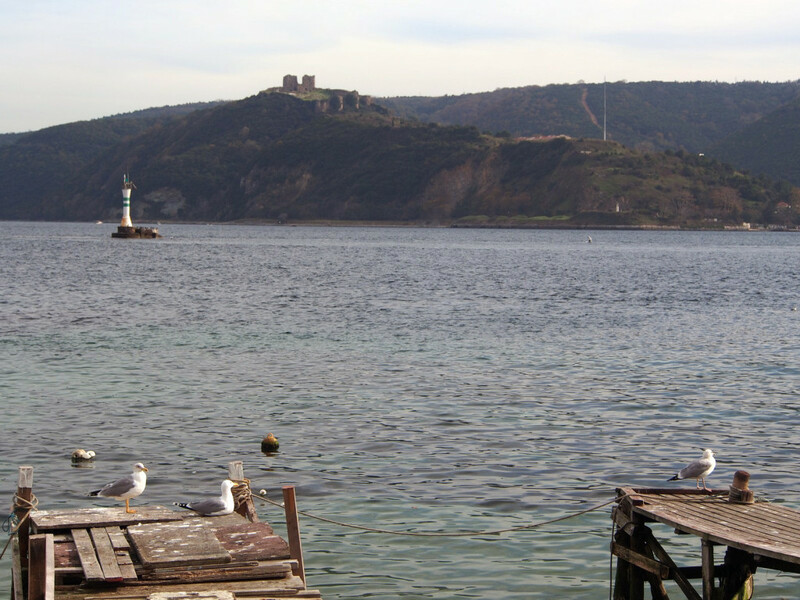 There was one more stop – a trip to the Gallipoli Peninsula, something of a pilgrimage for Aussies, as the (failed) military campaign there helped forge our national identity.